If you’re committed to a true Microsoft solution for monitoring your network and its associated services, Microsoft Operations Manager 2000 (MOM) is the product our friends in Redmond have for you. Unlike the products in the roundup, MOM relies upon agents on each monitored computer for full functionality. Furthermore, MOM is a Microsoft-centric product, which means that if you need to monitor Lotus Notes or Oracle databases, the core MOM package isn’t going to do it. Fortunately, NetIQ (which originally developed what has evolved into MOM) provides Extended Management Packs (XMPS) that extend MOM to Unix, Linux and so on, as well as allow it to interact with other enterprise-management solutions like Tivoli or HP OpenView. In fact, even if you want to monitor some Microsoft products, like Exchange, you need to get the optional Application Management Pack from Microsoft. Installing MOM is no small feat. Because of its complexity and ability to do much more than most, if not all, of the products reviewed in this roundup, you need to ensure that you have the prerequisites (and one or more powerful servers). These include SQL Server 2000, Microsoft Office, and a fairly robust network architecture, as MOM is quite chatty. After installing SQL Server 2000 and ensuring that your Windows 2000 Server computer has the requisite service packs and patches (you can test this by running a utility that ships with MOM), you’re ready to install. The default installation allows you to install all components on a single computer; but Microsoft doesn’t recommend this in all but the smallest environments. If you want to have a more robust configuration, you really need to follow the directions to the letter. Thankfully, the documentation is quite good and the updated Knowledge Base articles (296565, “Microsoft Operations Manager 2000 Pre-Installation Checklist”; 296566, “Microsoft Operations Manager 2000 Installation Checklist”; and 296569, “Microsoft Operations Manager 2000 Post-Installation Checklist”) fill in some of the blanks. Once MOM is installed, install the agents on the computers you want to manage by configuring the properties of one or more Agent Managers. You then approve the installation of agents on each selected node. Agents are installed automatically, provided you configure appropriate user permissions for the MOM service accounts (specified during the install). Once agents are installed, MOM can be used to manage computers and services, set performance manager thresholds and so on. You can configure scripts to run based upon a monitored event, add monitored events and/or specify conditions for the event. In fact, MOM is so versatile that you may want to get some assistance to make sure you properly configure it for your environment. 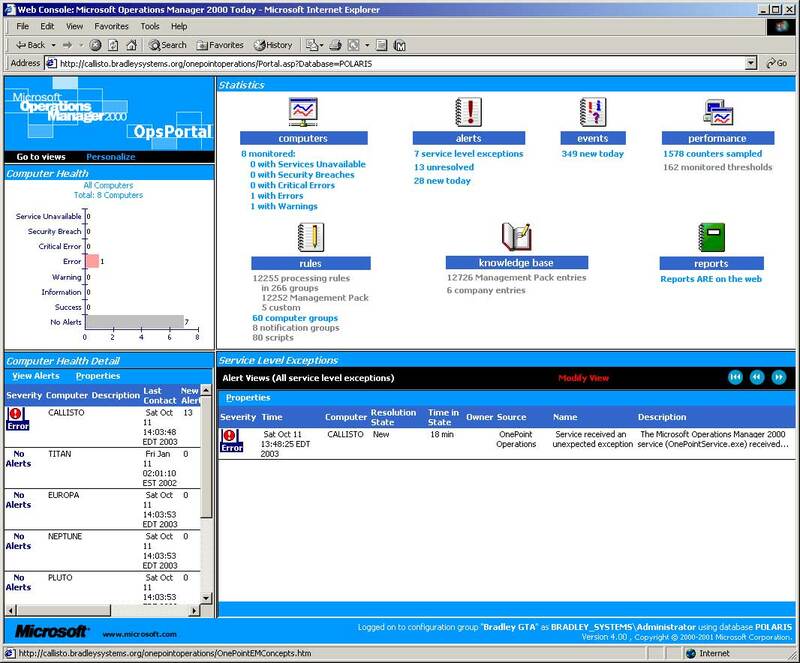 Administration of MOM and reviewing alerts and events can be done using a Microsoft Management Console (MMC) snap-in you can install on any Windows 2000 computer on your network or by visiting the Web page setup during install. The Web page can reside on any computer running IIS and doesn’t need to be on the same computer as the MOM service. The functionality of the Web-based interface and the MMC is identical. You can also run reports, but Microsoft Access needs to be running on the reporting computer. MOM does its job quite well, albeit with a lot of overhead when compared to the other products reviewed. It also lets you set customizable thresholds for performance alerts or monitor events for supported applications. It can notify you via e-mail (MAPI, of course) of any condition you configure on managed nodes and services. The MMC console and Web-based interface also let you track the status of a problem—from being notified, to assigning it to someone, to resolution. MOM is like your own mom—it watches over you and your resources and then fixes problems when they arise (or at least tells you about them). And, like your dear mother, it requires plenty of TLC (and resources) to keep it going. Microsoft Operations Manager 2000, $349 for the Base Processor License $349 for the Application Management Pack Processor License; Microsoft Corp. (800) 426-9400, www.microsoft.com.